I have always maintained a positive view of our insulation industry and advancements it has made in the United States. Therefore, I feel the challenges we have faced in the past 50 years have opened doors to many opportunities. What a difference a half-century makes. I recently came across the first DuPont Standard Thermal Insulation Specification Handbook, published in 1948. This little 24-page handbook has a section on how to determine the economic thickness of insulation for new projects costing more than $5,000. That was a big project then. Just as the cost of projects was lower, the products themselves were not as varied. For example, this handbook indicates two insulations for cold systems and two insulation materials for hot systems. Insulation finishes were asphalt cut-back, roofing felt or cemented A cloth. The insulation business was likewise less complicated 50 years ago. In the mid ’50s and early ’60s, the United States was in a construction phase. New industrial and commercial facilities were being built while the existing facilities constructed during the war were in disrepair. The failure rate of insulation systems increased with age and as industries became more complex. The insulation industry had to develop better insulation systems. The Occupational Safety and Health Administration (OSHA) implemented occupational noise exposure limits. Tests indicated that insulation reduced noise levels. This created another market for insulation. Insulation manufacturers responded to demand by developing new materials or improving their existing products. They introduced new elastomeric flexible foam insulation that was resistant to vapor moisture intrusion and easily installed. 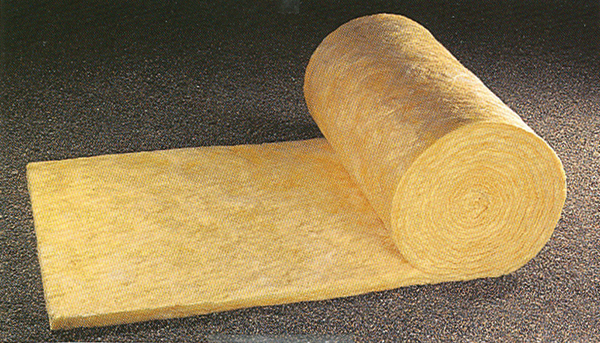 New, improved organic foam insulation found new applications. Fibrous insulation, with improved temperature limits and durability, expanded usage in the U.S. industrial and commercial markets. New cellular glass insulation with improved thermals was also introduced to the market. The insulation industry needed better insulation protection from environment and mechanical abuse. Roofing felt, and the labor-intensive cement and A cloth, were not the answers. 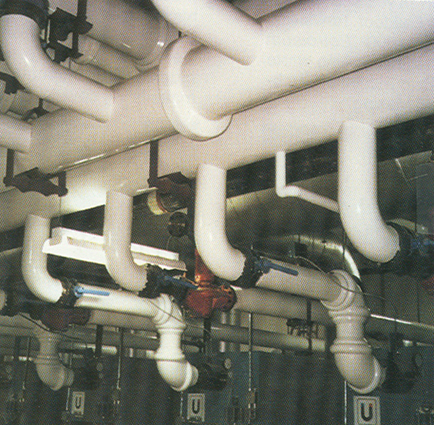 The industry introduced aluminum jacketing, which was found to be an economical way to meet these needs. Aluminum jacketing was first available in 6-mil thickness; however, this was too thin. Insulation fabricators quickly adjusted to market needs and offered heavier aluminum. Aluminum jacketing became the norm, especially for outdoor applications. Insulation contractors quickly adapted to this jacketing. This finish extended the life of insulation systems, was easy to install and made the insulation aesthetically pleasing to the owner. The metal fabricators also developed special, laminated jacketing for noise-abatement systems. 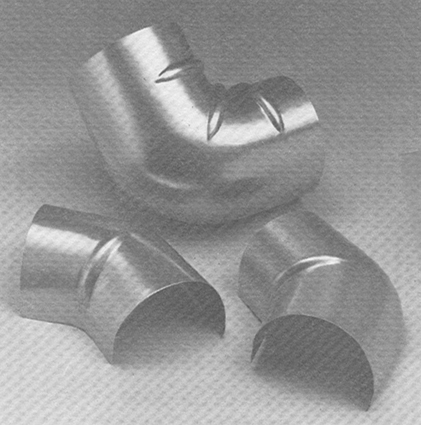 Where insulated pipe fittings were exposed to harsh conditions, aluminum and PVC fitting covers became available in the ’60s. The food industry needed a clean-appearing jacket for insulated pipe, one that could be washed down and was environmentally safe. 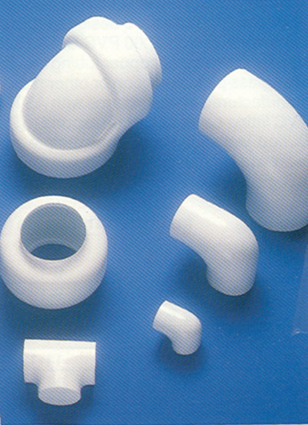 In the early ’80s, improved polyvinyl chloride (PVC) jacketing was developed and accepted by the FDA. Today, PVC (UV-inhibited) materials are considered acceptable in many other industries and applications. The failure of existing cold insulation systems and the increase of new colder processes got the attention of the insulation industry. Improved vapor retarders needed to be developed. Cold insulation systems were generally covered with asphalt cutback mastic and usually applied by hand. New vapor retarder mastics were introduced, ones that were easier to apply and were also environmentally safe. Tapes have better adhesion for application in cold weather. 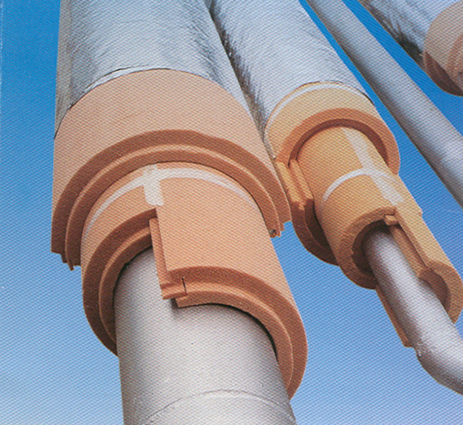 In the early ’70s an all service jacket (ASJ), fiber reinforced kraft (FRK) jacket was pre-applied to pipe and equipment insulation by the insulation manufacturers and fabricators. This aided the contractor in installing the insulation and jacket in a single step. A heavier abuse-resistant vapor retarder was needed for harsh industrial applications. 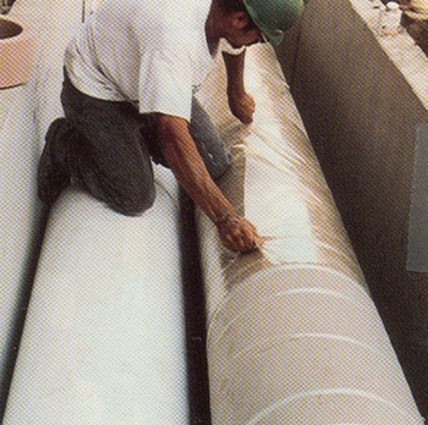 Heavy rubberized composite membrane sheeting was used on building foundations and later found to be useful to cover pipe insulation. Soon after, a manufacturer developed composite membranes with improved abuse resistance and vapor retarder, specifically for the insulation industry. 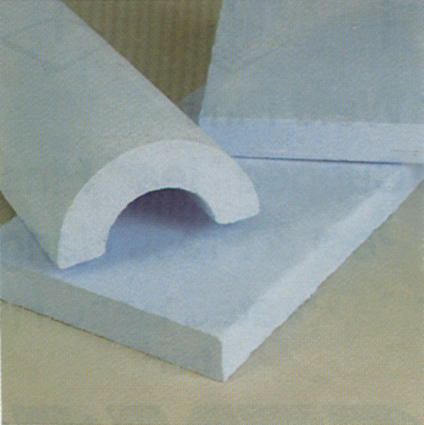 Polyethylene sheet material was introduced; it was easy to apply and offered excellent vapor resistance. 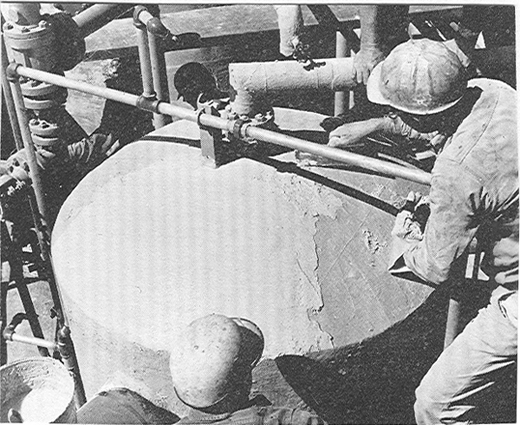 As late as the early ’60s, valves and flanges were insulated with insulation cement (mud) and then permanent oversize pipe insulation. 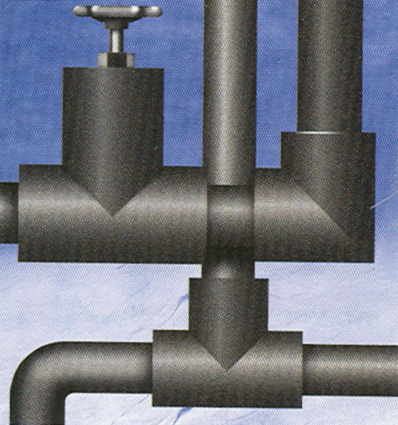 Chemical and petrochemical facilities in particular were producing many new hazardous products. To correct a leak or to inspect for leaks at the flanges, the insulation covering was destroyed upon removal. 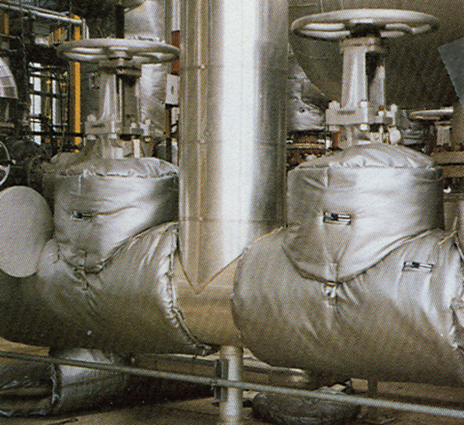 Again, an industry was born to develop and fabricate soft removable/reusable insulation covers for valves and flanges. New materials were developed to protect the covers from harsh environmental conditions. Soft-type removable covers were found useful for many other applications. Although there was an awareness that corrosion under insulation existed in the ’50s, little was done to address the problem until the late ’60s. 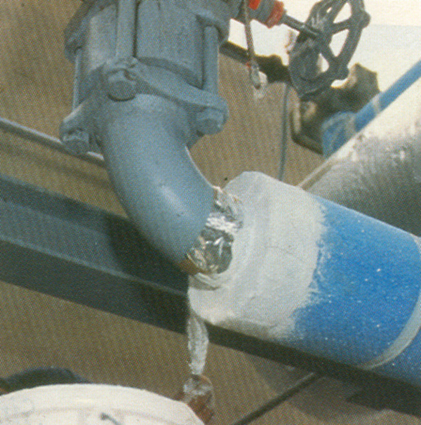 During this time corrosion under insulation was an accepted problem, and the leaks could be fixed by a welder. However, increased production of hazardous products and government regulations meant that any failures were unacceptable. 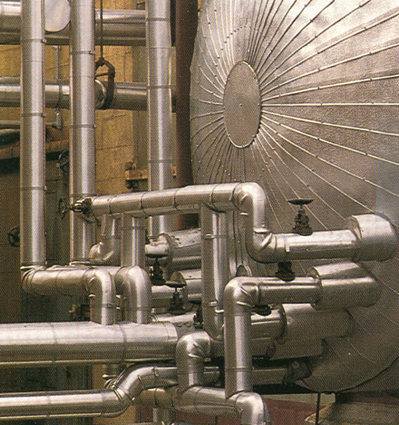 Most hazardous processes require stainless steel metal pipe and equipment. This metal was found to be susceptible to chloride stress corrosion cracking (CSCC). 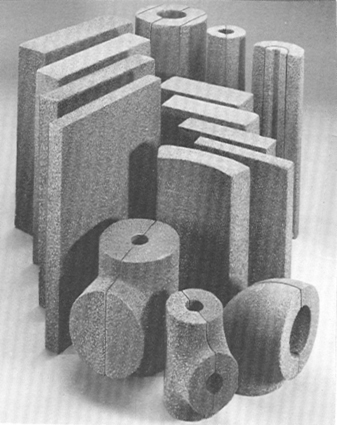 In the early ’70s insulation manufacturers developed an improved perlite silicate insulation that could reduce the potential of CSCC. Rather than destroy the insulation system to inspect for corrosion under insulation, the industry found a better way: removable/replaceable inspection plugs in the insulation. The non-destructive testing and examination under insulation for external and internal metal corrosion with instruments prevent catastrophic failures. Insulation contractors made a concise effort to prevent moisture intrusion into the insulation system through proper training and superior workmanship. Manufacturers introduced high-temperature silicone caulking sealants and low-temperature butyl sealants that could remain resilient for years. 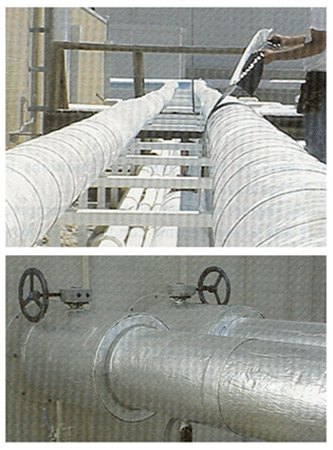 Occasionally, even the best insulation system cannot prevent corrosion under harsh conditions. This is when the substrate should be coated. In the late ’90s, the National Association of Corrosion Engineers approved new coatings (paint) systems for all types of metal under insulation. However, this work required a different craft and could delay work by the insulation contractor. Now available are gel-type coatings that can be applied by the insulation contractor when the insulation is installed. The late ’60s and early ’70s brought about one of greatest challenges to the insulation industry. 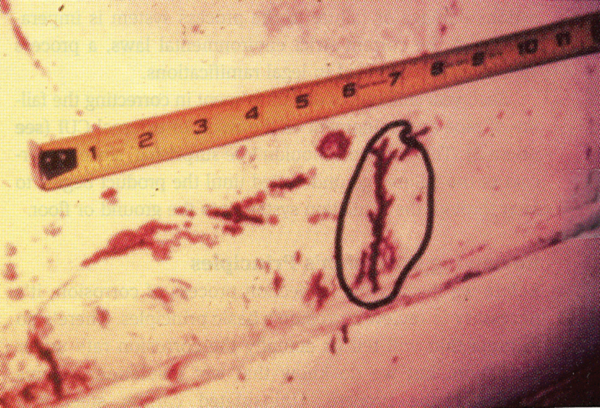 In 1970 EPA established guidelines in which asbestos was listed as hazardous. Many insulation manufacturers had to find a suitable replacement for asbestos. By 1973 all insulation produced in the United States was asbestos-free. The same issue had to be addressed in the manufacturing of mastics and cements. In 1986 OSHA issued a new standard for occupational exposure limits to asbestos for construction, abatement work sites and maintenance work. NIOSH, OSHA, EPA and state regulations on asbestos had to be met or exceeded. Many regulations differed in each state. In 1987, the Midwest Insulation Contractors Associations (MICA) Asbestos Abatement Committee developed a valuable guide and informational manual covering procedures and regulations for contractors offering asbestos abatement services. This guide was assigned to NIA (then NICA) for publication and national distribution. Dealing with asbestos placed an additional burden on the insulation contractors. They had to set up a team of insulators trained in the remediation of asbestos containing materials. 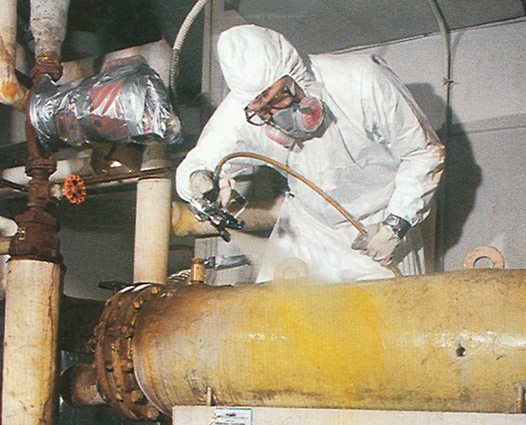 Around 1980, new asbestos remediation companies were born and flooded the marketplace. There was so much competition, an asbestos abatement contractor often had to bid too low–and take a loss–just to get the job. During this period the insulation industry became very complex. The small mom-and-pop insulation contractor could not compete. Many larger insulation contractors merged in order to survive. Insulation manufacturers developed various ways to identify their asbestos-free product from the material that may have contained asbestos. There was no national guideline to identify and label asbestos or asbestos-free insulation systems. If any material remotely appeared to be asbestos-containing material (ACM), it had to be analyzed by an approved laboratory before any insulation work could proceed in that area. Insurance companies dropped coverage or raised the premiums to unreasonable levels on many insulation and asbestos abatement contractors. In the early ’90s some contractors developed asbestos management programs. The idea was to encapsulate and identify the ACM rather than remove it. Identification of asbestos became mandatory. Because of the asbestos litigation, some insulation manufacturers and contractors filed Chapter 11 just to stay in business. Today, schools and the workplaces are environmentally safe. However, some insulation companies continue to bear the financial scars of the asbestos crisis. The asbestos crisis did not present an opportunity to everyone in the insulation industry. The oil embargo of 1973-74 saw oil prices quadruple to the equivalent of $38 per barrel (adjusted for today’s dollars). There was a need to conserve energy. Energy audits became popular. In 1976, infrared thermometry technology was offered to determine excessive heat loss in buildings. 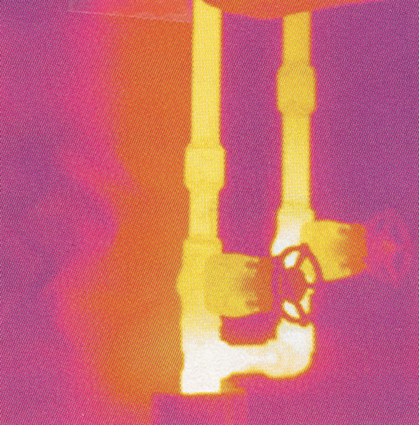 This technology was quickly utilized for evaluating heat loss on insulated pipe and equipment. "Retrofitting" existing insulation systems became a popular term. The nesting of insulation for multi-layers to accommodate thicker insulation became the norm. Energy intensive industries began to take a serious look at their heat losses. Many energy surveys indicated that existing insulation systems were in such disrepair or lacked such a quantity of insulation that retrofitting was not an option. A completely new insulation system was required. In 1976 the U.S. Department of Energy (DOE) set energy-reduction goals for various industries. Increasing insulation could reduce carbon dioxide and other harmful emissions. With the high cost of energy and support from the DOE, the insulation business thrived. By 1980, fuel costs began to drop to eventually reach less than the equivalent of $20 a barrel. Again, in 2005 we are faced with this same scenario of high energy prices, with no prediction as to its end. Again, this spells opportunity for the insulation industry. There was no national, regional or even local continuity in insulation standards, specifications and guidelines. Architectural and engineering firms and some larger companies developed their own specifications. Most of these specifications were not revised on a regular basis. The specified materials were not available and application practices were obsolete. Insulation contractors had to educate the customer when bidding on a project. This method of doing business presented problems with competitive bidding. To further complicate the situation, many new insulation products entered the market. Some insulation contractors developed their own specifications. This approach was not always successful. Insulation systems were installed that didn’t last a year. The credibility of the insulation industry was questioned because of a few maverick insulation contractors. 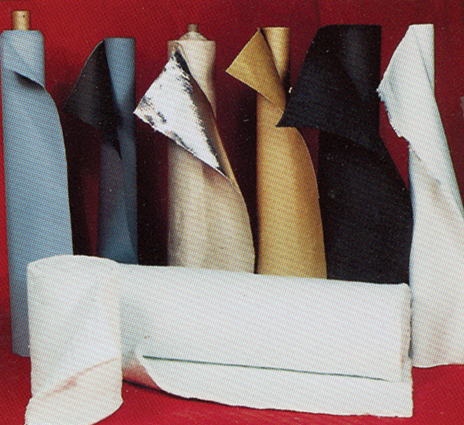 In 1979 MICA developed a manual of the "National Commercial & Industrial Insulation Standards." This manual was updated several times and is available from NIA. It provides acceptable installation practices and explains in practical terms the properties of insulation products. A manual, "Economic Thickness for Industrial Insulation," was issued in 1976. The manual was the effort of the Federal Energy Administration, assisted by members of NIA and engineers from varies industries. This manual was the forerunner of a computer program. 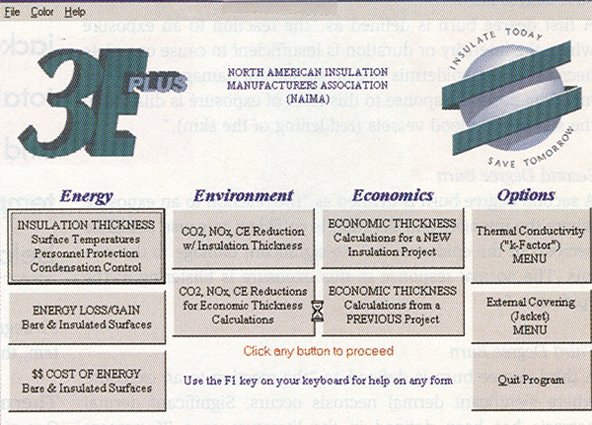 The North American Insulation Manufacturers Association (NAIMA) initiated the research in 1979 to develop a computer program. Today we know it as 3E Plus® 3.2. It is available from NAIMA free of charge. This program saves countless hours evaluating the economics of insulation projects. Many insulation manufacturers provide recommended insulation thickness and installation guides for their new products. The American Society of Testing Materials (ASTM) C16 Subcommittee on Thermal Insulation developed national standards on approved insulation materials and fabrication guidelines such as Standard C450, which is now available from ASTM on a CD. Several years ago, committees were formed to develop overall standard guidelines for the U.S. insulation industry. The Process Industry Practices Committee on Insulation worked diligently to complete a comprehensive National Standard Specification. Lastly, but importantly, Insulation Outlook magazine keeps the pulse on the insulation industry through technical articles, new insulation materials and companies in the news. Fifty years ago there were few federal, state and local safety standards. Many commercial and industrial facilities and contracting companies did not consider safety a major issue. In spite of this, DuPont Company, with which this author spent most of his career, was an exception. The company manufactured explosives prior to entering the chemical business. This probably explains why they always maintained strict safety training for contractors and DuPont personnel. The Occupational Safety and Health Act of 1970 and labor unions adopted many of their safety standards. By the mid-1970s, work safety rules had eliminated the most dangerous conditions. The owner was responsible for training contractors on all potential hazards unique to a site. In 1989, the National Insulation Contractors Association developed a “Hazard Classification Guide” to comply with OSHA. This guide was to train and inform employees of hazards such as chemicals and nuisance dust in the work area. The insulation contractor employees easily adapted to these new safety standards. All insulation work is evaluated for its degree of difficulty and safety compliance. NIA, in conjunction with the labor unions, provides instructional aids for up-to-date safety practices. Insulation contractors associated with NIA accepted this responsibility for their employees’ safety as a top priority of doing business. In the early ’80s city and state buildings limited the kind of materials for building construction, as well as materials used in the building. Some insulation materials were limited because they did not meet certain building codes in compliance with ASTM and NFPA tests. 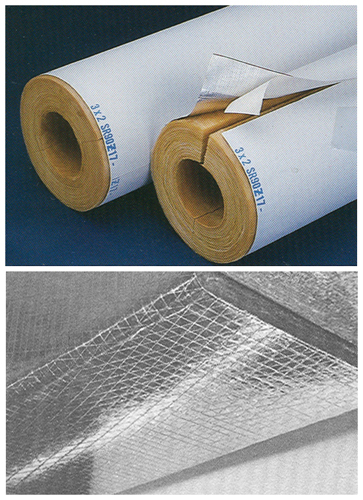 Some insulation products manufacturers had to develop a product for use in commercial and institutional buildings. Later, smoke density became the predominate concern. For example, the mastics industry developed a water-based mastic for hot application as well as a water-based mastic vapor retarder for cold systems. Special intumescent caulk and high-temperature insulation were developed for fire protection. In the ’80s basic computers, much like those we use today, made their debut. Some individuals and companies instantly saw the advantage of computers and incorporated them into their business. Others found it to be a challenge of great proportion. However, with improved user-friendly features, computers have become an acceptable and necessary tool in doing business. Contractors can use computers to search for perspective customers, transmit project schedules, generate daily reports, control insulation material requirements with distributors and fabricators and utilize programs such as 3E Plus 3.2. Because of the challenges in the past 50 years, the insulation industry is stronger and smarter. The bar was set higher, and each individual–from insulation products manufacturer to the insulator–has responded to the challenges in a positive way. 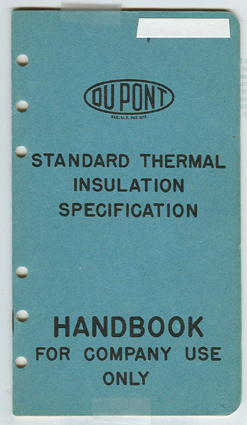 DuPont’s 1948 Standard Thermal Insulation Specification Handbook. Photo credit: The Dow Chemical Co.
Photo credit: Pittsburgh Corning Corp.
Photo credit: Childers Products Co. Application of new vapor retarder mastics. Photo credit: H.B. Fuller Co. 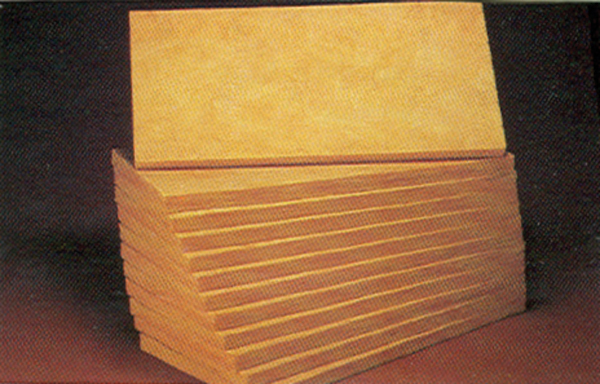 Examples of fiber-reinforced kraft all-service jackets. Photo credit: Johns Manville Corp.
Polyester sheet material vapor retarder. Photo credit: Thermal Energy Products Inc. Textiles to protect insulation covers from environmental conditions. Photo credit: Lewco Specialty Products, Inc. Example of chloride stress corrosion cracking (CSCC). Perlite silicate insulation designed to reduce potential of CSCC. Photo credit: Sproule Mfg. 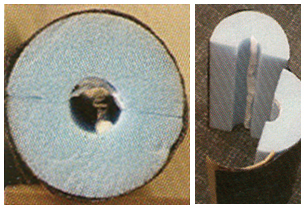 Co.
Photo credit: NDT Seals Inc.
New low-temperature sealant on pipe insulation. Photo credit: H. B. Fuller Co.
Gel-type coatings applied by the insulation contractor. Infrared thermometry used to determine heat loss. The home page of NAIMA’s 3E Plus®.